Functional and Integrative Medicine is patient-centered medical healing at it's best. Instead of looking at and treating health problems as isolated diseases, it treats individuals who may have bodily symptoms, imbalances and dysfunctions by addressing the root causes and not just addressing and treating symptoms. 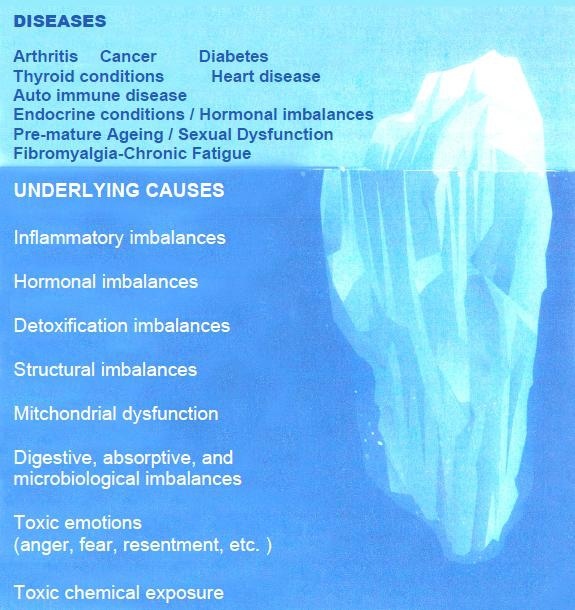 might be visible above the surface, but according to Functional Medicine, the cause lies in the altered physiology below the surface. Usually, the cause of the disease and it's symptoms is an underlying dysfunction or an imbalance of bodily systems. Named disease(s) are just the tip of the iceberg. Below the surface, according to Functional and Integrative Medicine, are the real root causes of a patient's health problems which in many cases are totally ignored with traditional Medicine. Thus the patient is in a Chronic state of Sickness with no end in sight. If health care treats just the tip of the iceberg, it rarely leads to long-term relief and vibrancy. Identifying and treating the underlying root cause or causes, as Functional and Integrative Medicine does, gives a much better chance to successfully resolve a patient's health challenge. Using scientific principles, advanced diagnostic testing and treatments other than drugs or surgery, Functional and Integrative Medicine restores balance in the body's primary physiological processes. The goal is the patient's lifelong optimal health. Today's health care system is in trouble because it applies a medical management model that works well for acute health problems to chronic health problems, where it is much less successful. If you have a heart attack, accident or sudden lung infection such as pneumonia, you certainly want a quick-thinking doctor to use all the quick-acting resources of modern medicine, such as life-saving technology, surgery and antibiotics. We are all grateful for such interventions. Unfortunately, emergency medicine is about 10% of the total picture of sickness and disease. The other 90% is due to ongoing or chronic changes of the body to which traditional Medicine today is unable to diagnosis and treat effectively. Just ask yourself how many people do not know today who are suffering for years or decades with little of no relief. How many of those same friends or family members are taking prescription medication and are developing new more extensive health challenges? However, jumping in with drugs, surgery and other acute care treatments often does not succeed in helping those with chronic, debilitating ailments, such as diabetes, heart disease or arthritis. Another approach is needed. Most prescribed medications have two functions: 1) Blocking receptor sites on the cell membrane and 2) shutting down or poisoning an enzymatic reaction either in the liver or the cell itself. This type of medicine just masks and treats symptoms but does not address the root cause or causes of the issue effecting the patient. Dr. Michael Badanek has been involved with Functional and Integrative Medicine since 1981 to the present date. Dr. Badanek is a licensed Health Care Provider utilizing Alternative Healthcare with extensive Graduate and Post Graduate continued training in alternative complementary medicine including nutrition, acupuncture, homeopathy applied kinesiology, functional and traditional allopathic medicine and electro-dermal screening with board certifications in homeopathy, naturopathic medicine and clinical nutrition for the treatment of your diagnosed condition. Dr. Badanek uses the latest most advanced techniques in the evaluation and diagnosis on health challenges presented with the best of what Traditional Medicine and Alternative Natural Medicine has to offer. Continue on this web site and read and study the hundreds of Articles under the Articles/Publication and BLOG Sections along with the other subsections on this web site which addresses health concerns and challenges that affect you or your loved ones. Schedule an appointment and we look forward in the aid and support of your health concerns or challenges. His real love is helping patients that have not responded to usual treatments. He prides himself in aiding patients that still are stilling searching for the answers to their conditions and refuse to give up. Many of his patients present with all types of chronic conditions. Email [email protected] or call 352-622-1151 in Ocala for a consultation.